Senior WordPress developer – permanent (Neg ctc). Are you interested in the world of digital marketing? Do you have experience building websites, using plugins, reporting on analytics and everything else related to WordPress? Then we want to work with you. 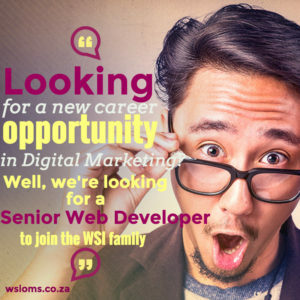 WSI is looking to hire a senior WordPress developer to help create solutions for our clients. As the senior WordPress developer, you will play a leading role in the creation of client solutions based on the use of WordPress themes and plugins. You will be managing all the WordPress projects within the company, guide the developers on what is required, do final QA and discuss changes/requirements with the client. You will also be taking all the projects live once they are completed and do the final QA on live; speed test, broken link checking, SEO checking – opengraph settings and all Meta tag settings; adding of Google analytics and the setting of goals on analytics, testing W3C compliancy, adding Webmaster Tools, etc.. Gathering and interpreting requirements from clients and designers, then translating them to WordPress theme based websites. Experience in integrating the required plugins for a client based on the desired solution.